Hi, I'm Dustin Keller, of the New York Jets and I'll explain you how to do my t-shirt. 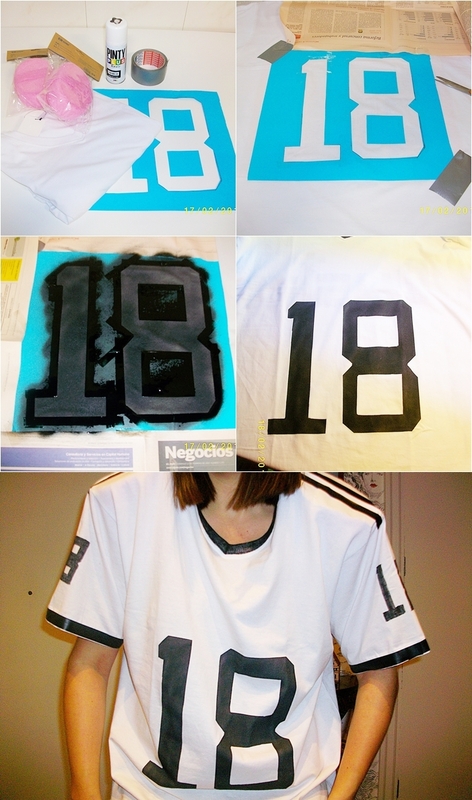 All you need is: 1 T-shirt, insulating tape, 2 sponges, 1 bottle of black spray, 1 permanent marker (wich is not in the pic, sorry) and a template with a number for example. -First of all you have to make a template, in my case with the number 18. Put insulating tape on the outline and apply the spray! -Stick the sponges on the shoulders of the t-shirt with some insulating tape too. -Paint the neck, the name of the player at the back, small numbers on the shoulders or whatever you want. That's it!! Soooooo simple,right? I'll show you the whole costume later. I'm going to prepare because we're hanging out today! WOOP WOOP!! Such a good ideaaa ! And it's so clean congrats ! Thanks for this DIY! And have fun tonight! Thanks fo your comment as always. Muy chula, un beso guapa. So much fun, you pull it off wonderfully! I really like this!!! hw do u wait to wash it ??? This is such a perfect way to save money and be creative. Great job! Good DIY job! I just did a T shirt too! oye dustin xk no enseñas por detras??? ?